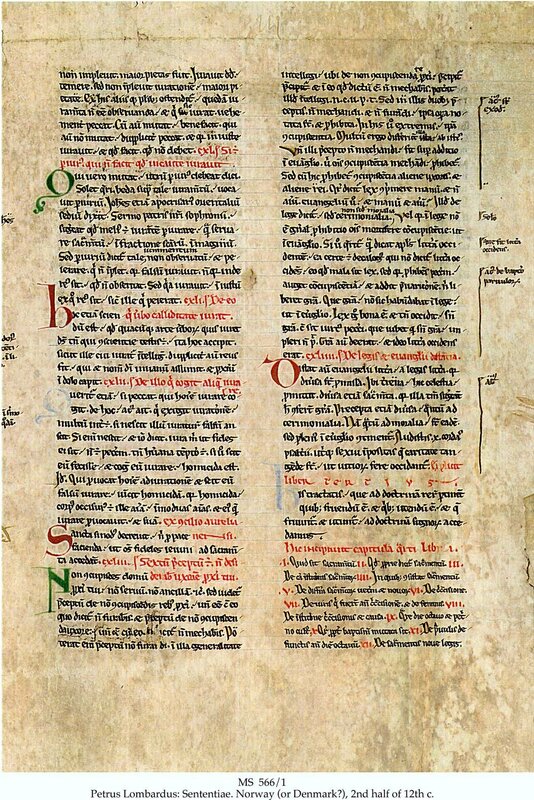 Description	 MS in Latin on vellum, Norway (or Denmark? 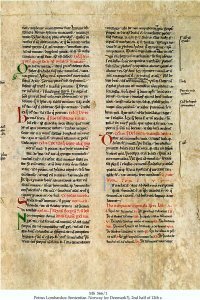 ), 2nd half of 12th c., 6 ff., 30x25 cm, 2 columns, (22x15 cm), 43 lines in a small Romanesque book script of low quality, rubrics in red, uncial initials in blue, brown, red or green. Context	 From a binding marked: "1573 til 1574 E" and "1560 G". Bound in boards covered with 4 ff., pastedowns from Peter Schöffer, Mainz: Missale Hafniense, 1483-1484. 2 further ff. of this virtually unrecorded incunable were flyleaves. These were sold to Morgan Library at Sotheby's New York sale 12.12.1991:39 "Incunables from The Schøyen Collection". Bound with MS 566/2. Provenance	 1. Rosenkilde & Bagger, København, Denmark (1989); 2. Sam Fogg Rare Books Ltd., London. Commentary	 Oldest Scandinavian MS in private hands, and among the earliest Norwegian MSS known.